The other day I was watching the news and saw that Tiger Woods just won his 13th major title — that is nothing short of phenomenal. 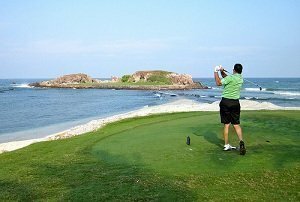 Then my mind drifted back to personal finance issues and it dawned on me that mastering golf is similar to mastering the art of investing. Here are my thoughts. Photo by jurvetson via Flickr. Goal: When you play golf, you have a well-defined goal — take the fewest number of strokes in 18 holes. You know the course rating, so you can guess where you will end up based on your handicap (or past performance). In investing, it is also good to have a well defined goal — e.g., why are we investing, how long do you have, what is the acceptable outcome, etc. So you start off my figuring out how much you need to retire, then work it backward and set up a plan that is likely to get you to that goal. Planning: In golf, you will more or less know your opponents and the course. You might know which holes will give you problem, and where you can make up some ground. In managing your finance, you can anticipate some of life expected surprises — e.g., child births, accidents, home purchase, etc. — and plan accordingly so that your investment plan stay intact. Tools: A golf bag is normally full of clubs and other tools; each are designed for a specific situation. You will be more successful if you pick the right tool for the right situation — e.g., you would not use your putter for your first shot from the tee. In investing, it is also good to know all your investment options and choose the right combination of investments for your situation. It would be most unwise to invest exclusively in stocks when you have other options like savings, money market, CDs, bonds, bills, mutual funds, ETFs, etc. Practice and persistence: I am sure Tiger Woods did not become a world-renowned player because he was born with “it”. I am sure it took a lot of practice and persistence before he got as good as he is. Becoming a good investor also takes a lot of practices, trials and errors, experimentations, etc. So do not give up on investing the first time you lose money. I made many mistakes before I know what I know today. Here are my 35 rules of common sense investing that may be useful to you. Trusted adviser: Even the greatest golf player has his trusty caddy at his side. A good caddy is not someone that lugs the golf bag around. He is also a good golf player who can provide information about opponents and the course, gives the player suggestions, cheers on the player, calms him down, etc. In investing, it is also good to have a trusted adviser — e.g., spouse, a hired professional, an investment club, friends, etc. Rain or shine: As long as you are prepare, you can enjoy golf rain or shine. The same is true for investing. It does not matter if it is a Bull Market or a Bear Market. A good investor can be successful in any market condition. Due Diligence: Do you think professional golfers simply walk on to the course and start playing? No way! They do a lot of research about the course, take measurements, examine each hole in detail, learn about their opponents, obtain information about the weather, and probably more. Even when they are on the course, they take many measurements and do their practice swings before they actually execute. Good investors also do their due diligence. They learn about the various investment options, understand the underlying business and fundamentals, and perform myriad analyses before they decide to buy or sell their investments. Risks and rewards: Can you take a stroke over the tree line and get ahead? Can you try to do it with 2 shots instead of 3? Perhaps, but there is always a risk that you might hit a tree, land in a sand trap, or sink one into the lake. As an investor, it is also wise to weight the potential risks against the potential rewards. Are you willing to invest your money in options and futures knowing that you will need it for your house down payment in a few years? Focus: Golf is a long game and you cannot let one or two bad holes ruin your entire game. In investing, there will be good days and bad days; you cannot let short-term swings dictate your long-term investment decision. Networking: Tiger Woods did not become who he is by himself. Throughout his life and career, he came across many people whom at one time or another helped him improve his game. In investing, it is also good to reach out and learn from other people. Perhaps you can reach out to someone that you know, or you can read books written by some of the greatest investors like Warren Buffett, Peter Lynch, John Bogle, and Benjamin Graham, just to name a few. Now, if I can get that darn ball to stop slicing. Lauren – thank you! I agree with you completely. Wow, nice article. I think the Practice and persistence thing is the absolute most important one in anything you do in life. Its easy to give up. Its harder to see it through.